Have you ever had one of those days where you could use some extra luck? I’m sure we all have those moments. If you’re looking for a special project to make for a friend in need, then this is the perfect project for you. 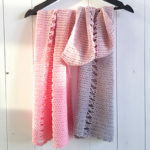 The Wish Me Luck Shawl is a great gift you can give someone who is having a tough time just needs a little bit of extra luck. 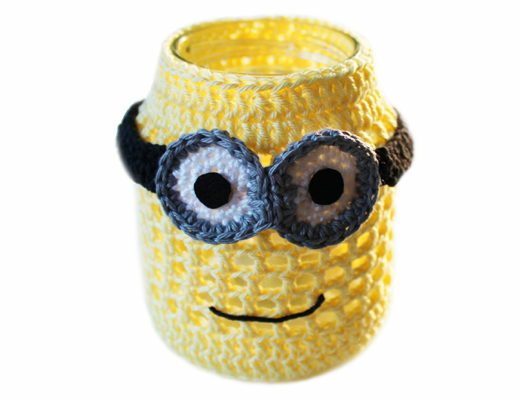 Let them know you’re thinking about them with a unique handmade gift! And don’t forget St. Patrick’s Day. 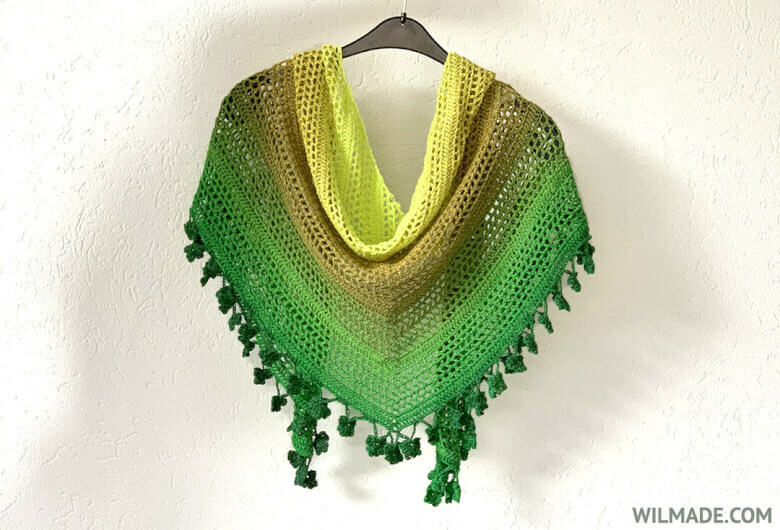 This shawl is a perfect addition to your St. Patrick’s Day wardrobe. Don’t be caught without green this St. Patrick’s Day! 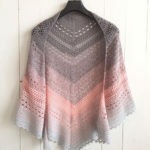 I wanted to create a simple triangle shawl that is beginner-friendly pattern and suitable for beginners who don’t have that much experience yet. 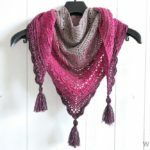 It’s entirely made with double crochet stitches and chains and has a lot of open stitch work. There are only 8 rows that need to be repeated; 6 rows are made out of chain spaces, and 2 rows are made with double crochet stitches. That’s all! The border is made out of little shamrocks or clovers. You can choose whether you want to make a shamrock (which has 3 leaves) or clover (which has 4 leaves). It’s a fun border to make and you can find step-by-step instructions in the video below. 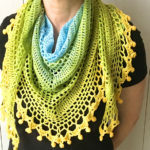 For this crochet scarf I used a Scheepjes Whirl in color ‘Key Lime Pi’. One yarn cake has a length of 1000m / 1094 yds and a weight of 220g/7.94 oz. I really love how the colors change in a very subtle way. It creates such a beautiful gradient effect! 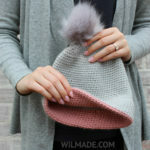 With this yarn you don’t have to worry about weaving in ends or picking matching color combinations. 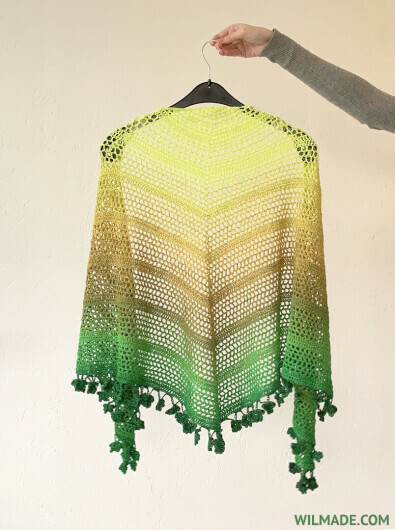 – 1x Scheepjes Whirl (color ‘Key Lime Pi 780’). 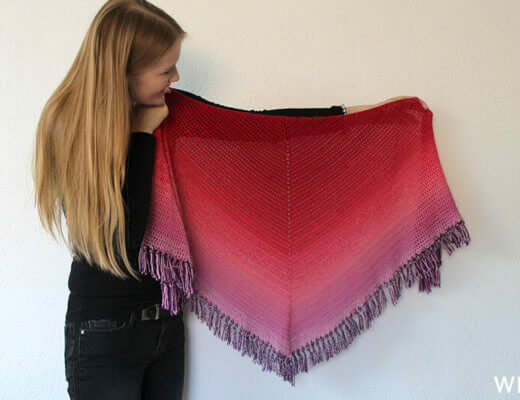 Below you can find a video tutorial of the Wish Me Luck Shawl. Use crochet hook 4mm. Start with 4 chains, slip stitch in the first stitch to form a ring. Or start with a magic ring (click here for my tutorial). Use a smaller hook: 3.5mm. See my video tutorial above. 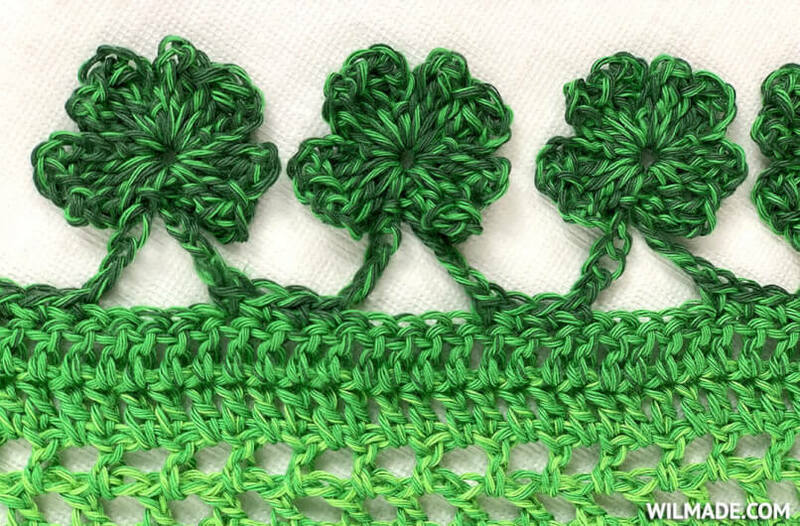 If you prefer a shamrock border, you’ll only have to make 3 leaves instead of 4. 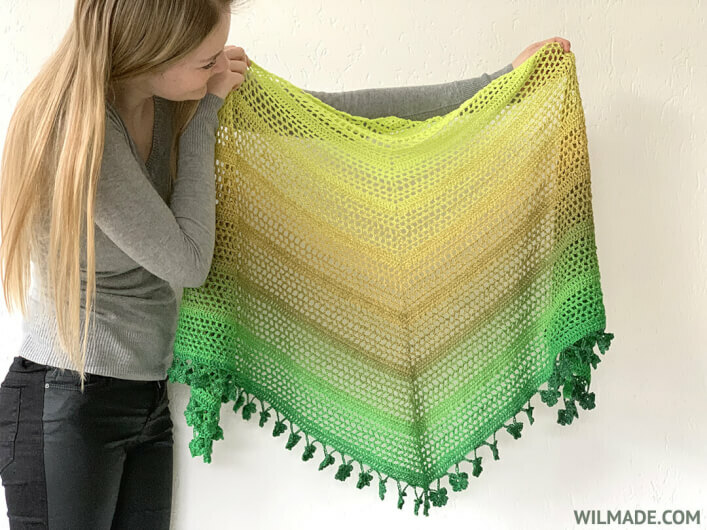 If you make this crochet shamrock shawl, please tag or mention me on Instagram @wilmawestenberg and add this pattern to your Ravelry queue. I would love to see what colors you used and feature some of your pictures! 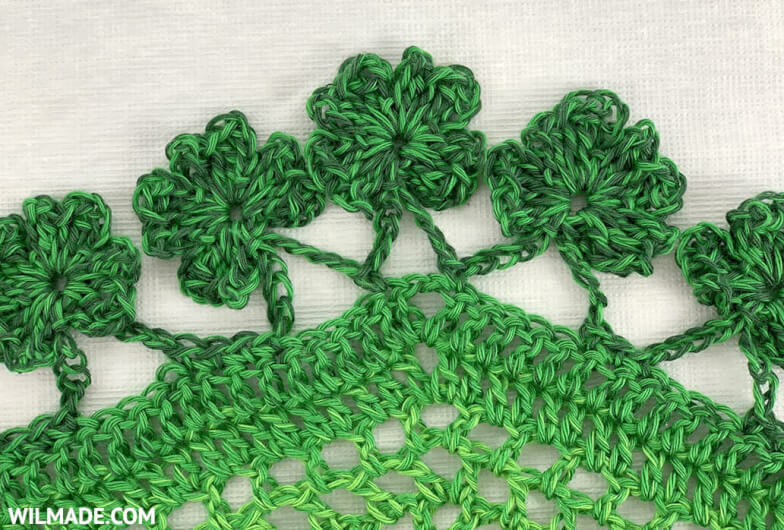 If you have any questions about this crochet shamrock shawl, feel free to join my Facebook Group. I created this group for you to share pictures/ progress, ask questions and to help each other out. Lady, you never cease to amaze me. Talented and beautiful. I love this shawl. Wauw, wat een mooi patroon weer. Heel erg feestelijk voor St. patricks day. Erg gaaf. Bedankt voor dit mooie patroon.